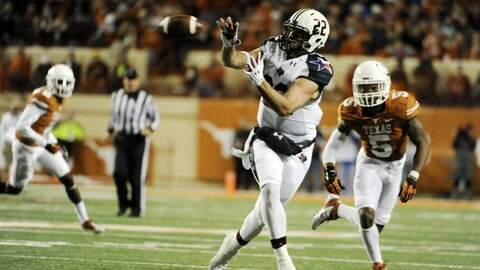 Texas Tech tight end Jace Amaro must have a good game Monday if the Red Raiders are to upset ASU in the Holiday Bowl. Arizona State and Texas Tech arrived in San Diego for the National University Holiday Bowl in very different places but seeking the same thing: One more win. The No. 14 Sun Devils most recently lost in the Pac-12 title game, missing out on the team’s first Rose Bowl berth since 1996. Regardless, it’s been the program’s best season since then and Pac-12 Coach of the Year Todd Graham and his team has a shot at an 11th win. The Red Raiders ride in on a five-game losing streak that marred highly popular first-year coach Kliff Kingsbury’s debut at the helm of his alma mater, which started 7-0. Texas Tech looks to snap the skid with an upset of ASU. Tyler Lockman of FOXSportsArizona.com and Mike Graham of RedRaiderSports.com and The Dallas Morning News cover these teams daily. Here, they break down Monday’s matchup via five key questions. Both can be followed on Twitter @TylerLockman and @MGraham17. 1. These teams enter this game after significant time off and both are coming off losses. Where does the team you cover stand in terms of motivation and mindset? Graham: Texas Tech has not played a game since Thanksgiving night. That game, quite frankly, was a disaster on national television against Texas. The Red Raiders allowed nine sacks, were gashed for 281 rushing yards and committed three turnovers to seal a minus-13 turnover margin in a 41-16 loss. The Red Raiders have made it clear theyâre hoping to shake all of their problems — a lack of momentum, an inability to stop the run and postseason turmoil in regards to quarterback Baker Mayfield’s transfer, as well as losing a beloved assistant coach to TCU. Arizona State provides plenty of motivation. Tech looks at its opponent as a great team, so it is not expected to go to San Diego and play a blow-off game. There are a lot of challenges the Red Raiders know they will face, but the game also is viewed as a great opportunity to finish the 2013 season on the strongest note possible. Lockman: The general assumption would be a team that fell one win short of a Rose Bowl berth — its stated goal from the start of the season — would experience a letdown in whatever bowl it landed. It’s natural to imagine the Sun Devils having a hard time getting excited about a Holiday Bowl berth after nearly earning a trip to Pasadena, but ASU has a lot to play for and coach Todd Graham is a superb motivator. ASU could finish the year with 11 wins for just the sixth time in program history. It also could secure the program’s best bowl victory since the 1987 Rose Bowl and improve a 0-3 Holiday Bowl record. And as Graham reminds his seniors regularly, this is their last game as Sun Devils. Under Graham, this group played inspired football. I’m not in the locker room or team meetings, but I would expect that to continue. They will have been off for three weeks but if their last practice in Tempe was any indication, this is a team fired up for one more game. 2. Both teams feature dynamic players on both sides of the ball. Which player from the team you cover could have the greatest impact on this game? Graham: It’s definitely tight end Jace Amaro in what could be his final college game. Amaro was a Tech’s first Rivals100 player ever and really broke out this season as a junior. He is responsible for more than 20 percent of Tech’s total offensive with 98 receptions for 1,240 yards and seven scores. He is a consensus All-American and was semifinalist for the Biletnikoff Award, as well as widely thought to have been snubbed by the John Mackey Award, which honors the nation’s best tight end. There’s no way to minimize his impact on a team that utilized two true freshmen quarterbacks this season. The signal callers liked to throw to Amaro on shorter routes because it was an easier throw and hard to miss his 6-foot-5, 260-pound frame. If Amaro has a good game, the chances are much higher the Red Raiders will remain competitive. The Sun Devils, like Tech’s other 12 opponents, just don’t have players who match up favorably with a tight end/flex receiver from a size standpoint. Lockman: I could choose any number of players here, but given ASU’s situation at running back right now I’m going with quarterback Taylor Kelly. With Marion Grice almost certainly out due to a leg injury and backups D.J. Foster and Deantre Lewis expected to play but still nursing knee injuries, ASU might have to rely on its passing game as well as Kelly’s ability to run. Even when ASU gets the run game working, Kelly’s performance typically sets the overall tone. If he can avoid turnovers and gets time to work, he’s got plenty of capable targets. While it seems likely ASU can beat Texas Tech through the air, it will be much easier with a running game. Foster’s ability to perform will be paramount, and Kelly’s legs will matter too. Two of ASU’s three losses — and perhaps all three — were due in large part to an ineffective run game, so the Sun Devils will still need to move the ball on the ground in this game. 3. Texas Tech has the nation’s No. 2 passing attack while ASU has one of the Pac-12’s best defenses and its own potent offense. What could be the difference, on either side? What could be an advantage? Graham: Tech’s receiving unit, top to bottom, rivals any team in the country. Amaro could be a first-round NFL pick if he skips his senior year. Senior Eric Ward will probably have opportunities to play professionally next season as well. Bradley Marquez is so athletic he plays baseball in the summer for the New York Mets organization. The 5-foot-6, 160-pound Jakeem Grant is an explosive slot receiver who mows down opponents with jukes. But there are still big, self-inflicted problems for Tech’s passing attack at the front end of the equation. The offensive line gave up 33 sacks and true freshman QB Davis Webb threw nine interceptions. Sophomore quarterback Michael Brewer, presumed to be the starter at the beginning of the season, was unavailable for the season’s first half with a back injury and then was deemed too far behind to compete with the younger quarterbacks. With a month of preparation, he might get his long-awaited first start and we don’t know what Tech would get from him, good or bad. Lockman: As it was so many times this season, ASU’s ability to pressure teams defensively could be its greatest asset. Texas Tech’s offensive line is tied for 104th in the nation with 33 sacks allowed and ASU’s defense ranks seventh in the nation with 40 sacks — not a good matchup for the Red Raiders. The uncertainty at quarterback makes this even more troublesome for Texas Tech. Each of ASU’s three down linemen — Will Sutton, Davon Coleman and Gannon Conway — as well as linebackers Anthony Jones and Chris Young will be in their final college game. Linebacker Carl Bradford, who’s mulling a jump to the NFL, may be as well. That group should be highly motivated to raack up tackles for loss and sacks. If they do, Texas Tech may have trouble getting the offense going, though its ability to get rid of the ball quickly should help some. 4. From a big-picture standpoint, which team needs the win more? Graham: Tough question. Arizona State was a great team one win shy of the Rose Bowl. The Red Raiders need the win to scale back concerns 7-5 seasons are the new norm. I think Todd Graham has instilled a lot of stability in his program. Theyâll be back on this stage or better very soon. Tech will lose several key players on the defense immediately after the game and could lose Amaro to the draft, so there is a thought the Holiday Bowl will be a long-term high point in the sense it’s a more prestigious bowl than the Big 12’s future affiliations with the Liberty and Heart of Dallas bowls. The Holiday Bowl was a pivotal game for the Tech program under similar circumstances back in 2004. In that game, the Red Raiders upset No. 4 Cal, went to the Cotton Bowl the next year and began building up to a run at the national championship in 2008 with Michael Crabtree. That is to say it ushered in what Tech fans would consider a golden era. Potential recruits definitely will notice an upset win against a top program. That would pay dividends for the Red Raiders as early as New Year’s Eve through the critical summer months with the 2015 class. A Tech win would help erase a bad taste through the second half of the regular season and ease pressure on a program that could really afford some positivity through the summer. My question is: Will a team that only lost to Stanford and Notre Dame prepare for the Red Raiders seriously? Lockman: While an 11-win season and the program’s best bowl win in 26 years would be huge for the Sun Devils, the reality right now is probably that the Red Raiders need it more. Mike is right that a win now would help bury the negative feelings of a 7-0 start and 0-5 collapse, and an eight-win season under a first year coach is in most circumstances consider a great start. However, that does not mean the Sun Devils want it any less. They too have a bad taste in their mouth after losing the Pac-12 title game. No one wants to end the season with a loss (though Tech ending with six straight would surely be more painful), particularly seniors on their way out. An 11th win would help ASU’s profile nationally but probably not have much of an impact on recruiting this year because ASU already has a solid, nearly-full class. 5. Who will win this game, by what score and why? Graham: Another great question. I’m not convinced the Red Raiders are as bad as their record indicates, and I’m not convinced there is a great deal of disparity between the Pac-12 and Big 12. Tech’s conference was supposed to be weaker this season yet it had three teams deserving of BCS berths in Baylor, Oklahoma and Oklahoma State. Baylor and Oklahoma got the nods. The then-undefeated Red Raiders played Oklahoma to an eight-point loss on the road and roared back from a 21-3 deficit to a 28-24 halftime score before falling 52-34 the next week against Oklahoma State. I imagine the losses took a toll on the team’s mentality. It had a month off and will enter the game with 20 more practices under its belt. It would not surprise me to see a rejuvenated team push the Sun Devils for a good amount of the game. That being said, Arizona State has clear advantages along its defensive line as well as a multi-faceted offense that should be able to take advantage of Tech’s widely known weakness in the run game. It’s really the Sun Devils’ game to lose. For Graham’s score prediction, visit the Dallas Morning News college sports blog on Monday. Lockman: While I think there is some intrigue in the matchup, I also think the Sun Devils are heavy favorites and I’m picking them to win 52-31. Yes, I don’t expect it to be close. Even with ASU’s uncertainty at running back, I believe ASU’s offense will be too much for Texas Tech’s defense, which allows 419.1 yards and 31.2 points per game. I also think ASU’s defense will be well equipped to contain the "Air Raid," given its experience against Washington State. It may give up a lot of yards but it should contain more than enough to win. In ASU, we’re talking about a team that lost twice to Stanford and lost to Notre Dame only because it beat itself. There’s a case to be made this is a top 10 team, and as long as it’s motivated in San Diego it should cruise to win No. 11.